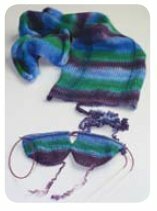 We have a wealth of information available for you about how to dye and knit our double-stranded sock blanks! Our new double-stranded Sock Blanks double your fiber fun! First, play with your favorite colors in a never-ending variety of ways. Second, watch your colors reflect your unique style as you knit a pair of perfectly matched socks. Easy-to-use Jacquard® Acid Dyes make it hard to resist building up a stash of colorful possibilities. Soak your sock blank in tepid water for at least an hour, longer if possible. The sock blank is double-stranded, and you want to make sure that it’s evenly wet all the way through before dyeing to make sure that the dye will saturate evenly. 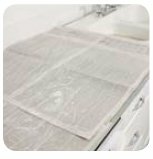 Lay down several layers of newspaper over your work surface. Then, lay out a long piece of plastic wrap down the middle of your work surface. This piece of plastic wrap will be directly beneath the sock blank as you dye it, and later you will roll it up around the sock blank. Safety Warning: Always use gloves to prevent the dye from staining your hands. Wear a dust mask to minimize the chance of breathing in airborne dye particles. Limit the amount of time that you have the dye jars open and mix your dye powder with water immediately to prevent the dye from getting into the air. Remember to dye in a place with adequate ventilation. Premixing your dye in mason jars will allow you to mix the dye more thoroughly, and you can also save your dye stock right in the jar for later use. Measure ½ teaspoon of dye for each cup of water. You can also add 3 tablespoons of vinegar directly to the dye in this step—please see our “Planning Your Dye Scheme” tutorial to decide whether you would like to use vinegar in this step. *Remember, limit the amount of time that you have your jar of dye powder open in order to prevent airborne dye particles. Once you have measured the dye powder into the jar of water, close the lid tightly and shake it gently in order to mix. You want to make sure that the solution is completely mixed, as leftover specks of undissolved dye powder can leave spots on your finished sock blank. Remove your sock blank from the soaking water and gently squeeze the water out of it. Wrap it in a towel and then step on it to get most of the water out. Alternatively, you could spin out the excess water in your washing machine’s spin cycle. You want the sock blank to be damp, not dripping. Fill your condiment/squeeze bottles with dye. Starting with the lightest color, apply dye to the sock blank in your chosen pattern. Don’t oversaturate the yarn with dye—the colors will run into each other and the dye might pool beneath the yarn. You can also use your gloved fingertips to massage the dye into the sock blank. This will help prevent undyed interior bits of yarn in your sock blank. Wipe excess dye from the plastic wrap. Wrap your sock blank into a tube, then wrap it once more with an additional layer of plastic wrap. Coil your sock blank into a tidy package. Bring 2″ of water to a simmer in a large canning pot that you only use for dyeing—the pot will not be food safe after you use it with the dyes, and you should no longer use it for cooking. Use a vegetable steamer, piece of aluminum foil with holes poked in it, or a canning rack in order to keep your sock blank out of the water. Place your plastic-wrapped sock blank bundle in the rack and steam it for 30 minutes, timing from when the water reaches a boil. 1. Make sure to cover your pot with a lid in order to keep the steam in and keep the temperature constant. 2. Watch to make sure that the water doesn’t completely boil off; if it gets low, add a little more water without pouring it over the sock blank. 3. Double-check that you’re actually getting steam—you need the water at a boil in order to get enough steam. If the water is just simmering, increase the heat. 4. If steaming multiple sock blanks, rotate your wrapped bundles in the steamer basket so that they all get heated evenly. After steaming for 30 minutes, turn off the burner and remove the pot from the heat. Let the sock blank cool in its plastic wrapping right in the pot. Don’t open the hot plastic wrap —you could get a steam burn. If you’d like to cool your bundle more quickly, you can add it (still wrapped) to a bath of lukewarm water. Once the bundle is cool, open the plastic wrap and remove the sock blank. Rinse with tepid water until the water runs clear. 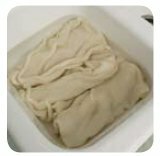 Wrap the rinsed sock blank in a towel and step on it to remove excess water. You can also use your washing machine’s spin cycle to spin the remaining water from the blank while it is wrapped in a towel. Place your sock blank on a hanger and allow it to air dry. Water will wick to the bottom and drip off, so you may want to air dry it over a bathtub or lay a towel beneath it. Knit straight from the sock blank! You can knit both socks at the same time. The yarn will be crinkly, but this will ease out in the first wash/block after the sock is knit. Our sock blanks are superwash, but if using these instructions for non-superwash wool take care to avoid agitating it so that you don’t inadvertently felt your yarn. Mind the following tips to prevent felting. 5) If spinning your fiber in the washing machine, make sure that your machine doesn’t pour in additional water during the spin cycle. The running water might felt your fiber. This entry was posted in Dyeing, Video Tutorials, View All by Knit Picks Tutorials. Bookmark the permalink.